Top faculty and renowned scientists intersect at WSU Tri-Cities, providing students with an unparalleled research and learning experience. Innovation happens in every corner of campus with our world-class research portfolio. Share the hallways with the world’s largest engineering firms, learn from productive and quality faculty and collaborate with researchers on problem-based projects. 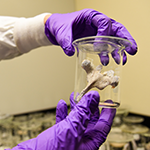 Washington State University and the U.S. Department of Energy’s Pacific Northwest National Laboratory have a long history of collaborating on research projects as well as providing hands-on educational experiences that lead to career opportunities. In addition, more than 800 WSU alumni work at PNNL as scientists, engineers, and other professionals. 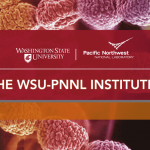 In 2018, WSU and PNNL accelerated this collaboration, expanding research and educational and training programs. They have formed three joint institutes to advance science and technology in areas that are critical for the nation and Northwest: Nuclear Science and Technology, Advanced Grid, and Bioproducts. See the news release, program, video, and photos from the April 3, 2018 launch celebration. Create and support an ecosystem of industrial, government and university participants who will benefit from the tools, technologies and discoveries that result from the Institutes. 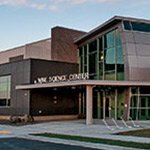 Boasting one of only three Wine Science Programs in the country, WSU Tri-Cities remains on the cutting edge of technology and culture. Our newly opened Ste. Michelle Wine Estates Wine Sciences Center debuted in 2015 is considered one of the most technologically advanced wine science centers in the world. It features research laboratories and classrooms, a research and teaching winery, a two-acre vineyard and greenhouses to train technical personnel to support Washington’s large and expanding wine industry. Industry members, students and researchers from around the globe will use the center as a gathering place to spark innovation, fuel economic development and support local, regional, national and international collaboration and provide a catalyst for research breakthroughs. The Bioproducts, Sciences and Engineering Laboratory (BSEL) opened May 2008 on the Washington State University (WSU) Tri-Cities campus in Richland, Washington. The $24 million, 57,000-square-foot research and teaching laboratory is a partnership between WSU and the Pacific Northwest National Laboratory (PNNL) operated by Battelle. BSEL features the Biorefinery and the Combinatorial Catalysis Research Lab, plus a variety of laboratories and classrooms. The facility establishes the Tri-Cities as a center for world-class bio-based product research and development, creates a magnet for prominent scientists, and helps the Northwest agriculture industry be more competitive. 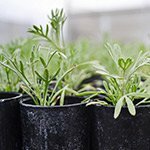 The Food and Environmental Quality Lab (FEQL) works to ensure the quality and safety of food, the long-term sustainability of our food-producing lands and surrounding environment, and the economic viability of the agriculture and food industries of Washington State. The FEQL is a state-mandated facility (since 1993) that provides oversight on coordinated USDA-US EPA dietary risk assessment studies under federal 40CFR Part 160 Good Laboratory Practices (GLP). As part of this research mission, the WSU-FEQL has completed well over seventy human and environmental regulatory science technical assessments with many having a direct impact on public health regulations at the state and national level. The Washington State University Irrigated Agriculture Research and Extension Center (WSU-IAREC) is the focal point for the University, the U.S. Department of Agriculture – Agricultural Research Service (USDA-ARS), and the Washington State Department of Agriculture (WSDA) research, extension and plant certification programs that address the concerns of irrigated agriculture. 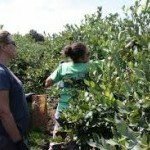 An estimated two-thirds of the agricultural production in the state comes from irrigated land, making such research of vital interest to Washington’s economy, both for intrastate distribution and exportation. IAREC faculty collaborate with faculty on the WSU Tri-Cities campus and work closely with our graduate students. 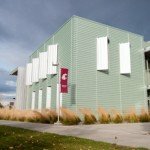 The Registries are operated by the Washington State University (WSU) College of Pharmacy, with administrative offices and laboratory facilities in Richland, Washington. The USTUR studies the biokinetics, dosimetry, and possible biological effects of actinides such as uranium, plutonium, americium and thorium in humans. Samples of body organs are acquired post-mortem from volunteer donors who worked with actinide elements and who had a documented intake of one or more of these radionuclides. Scientific data from partial and whole body donations are de-identified and made available for scientists interested in studying the distribution and dosimetry of actinide elements in the human body.